Norman Rockwell (1894–1978). The Right To Know, 1968. Oil on canvas, 29” x 54”. Illustration for Look, August 20, 1968. Private Collection. © Norman Rockwell Family Agency. We are not fierce, and the truth will not frighten us. Trust us, for we have given you our trust. We are the governed, remember, but we govern too. In The Right to Know, published in Look Magazine on August 20, 1968, Norman Rockwell paints a cluster of people united and glaring at the viewer with a familiar and demanding gaze. 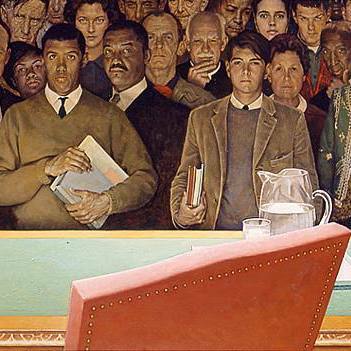 A wide array of different age groups, races, genders, and backgrounds populate the painting with Rockwell himself (to the far right) as they anxiously and expectantly look past the red chair and dais. This congregation exemplifies America and its citizens as a whole, where regardless of color, style, age, experience, or class, they are still Americans. From the khaki jacket of an everyday-type-of man to the left, to the professional attire evident on both students and adults, to even the vibrant new styles donned by both the male and female hippies on the right, no one person has an expression much different than his or her neighbor. Rockwell was originally commissioned to create a painting in support of the Vietnam War in 1967, but ultimately produced The Right to Know the following year as a critique of the United States government’s lack of honesty and their relationship with Americans in the midst of the 1960s and the Vietnam War. In the ‘60s, perturbed Americans experienced a period of distress, anxiety, and distrust as a result of unfolding events. The civil rights movement, a series of feminist movements, and student protests challenged social and political dogma in attempts to address the experience and improve the lives of the oppressed and unrepresented at the time: African Americans, women, and college students. Political consciousness was raised in 1971 as a result of the publication of confidential information on the Vietnam War in the infamous Pentagon Papers (in which the government monitored and documented the status of the conflict), although the controversial 1968 candidacy of President Richard Nixon had already raised suspicions and uncertainty. The nation was also rocked and sickened that same year by “the senseless and tragic deaths of Robert Kennedy and Martin Luther King Jr.,” as quoted in the New York Times. These combined circumstances of the ‘60s were coupled with the fact that the Vietnam War was unwelcomed and unsupported by the public despite President Lyndon B. Johnson’s commitment to interfering further in Vietnam. The Vietnam War, “in which 16,000 American soldiers had died, fueled the powerful political statement of Rockwell’s painting on the right of citizens to know the reasons behind its government’s actions” (Artdaily). The Right to Know, which contrasts significantly with Rockwell’s typically upbeat paintings, captures the time period and conveys what it means to be American in the mid-20th century. 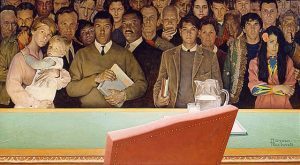 Rockwell appeals to any and all people affected in the ‘60s, uniting races, genders, and age groups to indict government leaders and represent the collective opinions of the public as well as his own. Touching on the student protests and civil rights and feminist movements, Rockwell paints two male students, one white and the other black, standing front and center of the audience while a young boy and child and a female hippie stand beside them. The secrecy of the situation in Vietnam, as argued by Jane Allen Petrick in Hidden in Plain Sight: The Other People in Norman Rockwell’s America, created an “information gap that existed between government and the public,” and The Right to Know serves to suggest the importance of a united America during the war despite its political salience. Further, Richard Lau, Thad Brown, and David Sears suggest in Self Interest and Civilians’ Attitudes Toward the Vietnam War that “the war intruded directly and tangibly into the personal lives of a substantial number of Americans.” In response, Norman Rockwell immortalizes a hypothetical moment where a group of unified citizens, having served and remained loyal to the United States in previous wars, look onto us, those they put in the seats of power, and demand in concert the respect and right to know about what’s going on — to feel like Americans in their own country.